After three months of continuous activity, S. Thorarinsson reported on 21 April that the Heimaey eruption is slowly abating. The explosive activity is now intermittent and the estimated lava production is less than 5 m3 per second. The area of the lava flow is 2.1 km2, and the average thickness is about 70 m. The height of the volcano is approximately 220 m.
The Global Volcanism Program has no Weekly Reports available for Vestmannaeyjar. The following cable was received . . . on 23 January 1973. "An intense volcanic eruption on the vast side of the mountain Helgafell, Vestmannaeyjar, Iceland, was observed at 0155 GMT on 23 January 1973. Lava is flowing eastwards from a fissure some 1,500 m long. Approximate location: Latitude 63°26' N, Longitude 20°16' W. The eruption was preceded by a swarm of small earthquakes on 22 and 23 January. The largest earthquake was 2.6 on the Richter scale. 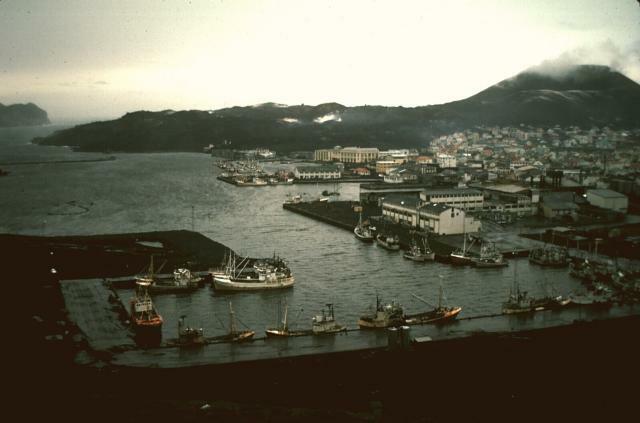 The nearby town of Vestmannaeyjar, inhabited by about 5,000 people, has been mostly evacuated to the mainland. No casualties." The following information was obtained through telephone and telegraphic contact with the Icelandic Meteorological Office. "The Helgafell eruption continues. The fissure is 1.6 km in length and on the eastern slope of the volcano. At first, mostly lava fountains characterized the eruption, but now there is a great quantity of smoke. The fissure extends in a straight line and trends in a direction NNE-SSW. It extends into the sea at both ends, and small islands seem to be forming near the coast under the sea as lava continues to extrude from the fissure. Fire and pyroclastic clouds are visible, and the lava fountains reached 375 feet in height. "The eruption was preceded by a swarm of earthquakes beginning at 2000 GMT on 21 January with origin within 10 km from the fissure. The main swarm recorded at a seismic station some 60 km away was between 2200 GMT on the 21st and 0600 GMT on the 22nd. At least 200 earthquakes, recorded mainly between 0100 and 0300 on the 22nd. A few earthquakes were then recorded until 1100 GMT on the 22nd but after that no earthquakes until 2330 GMT that evening. From 2230 to 0134 GMT on the 23rd, seven earthquakes were recorded. During this period a few earthquakes were felt in Vestmannaeyjar. The largest earthquakes were magnitude about 2.7 Richter on the 22nd at 0416 GMT and 23rd at 0134 GMT." The following cables were received . . . on 26 January. [The following was received from the Icelandic Meteorological Office.] "Height of Vestmannaeyjar eruption cloud was estimated from aircraft to be as follows: 15,000-16,000 feet at 1644 GMT on 24 January; 18,000-20,000 feet at 1025 GMT on 25 January; 22,000 feet at 1305 GMT on 25 January." [The following was received from the Icelandic Marine Research Institute.] "Ecological changes in sea strictly local and will not have any economic effects. Land vegetation badly damaged by lava and airborne material at least in the neighborhood of the eruption. Effect on other systems on land, such as vegetation further away and bird populations, still known. Lava continues to pour into the harbor and water temperatures have reached 111°F. AT least five houses were destroyed by fire started by the lava. The 1.6 km rift has become partly filled with lava. One main crater and several smaller craters are expelling fire, smoke, and lava." The following cable was received . . . on 26 January. "Flight over Heimaey at 2200 local time on 26 January revealed activity concentrated in northern sector of fissure zone. Strongest fountaining is from new cone at southern terminus of this sector now built to about 120 m above sea level. Fountaining rises an additional 150 m above cone. About six other smaller fountains at about 100 m intervals to north along fissure. Lava flowing mainly northwards forming bench which now extends for at least 500 m out from coast. Six houses have now been set alight in Kaupstadur by hot tephra." The following cable was received . . . on 27 January. "27 January, 1100 GMT. When Heimaey eruption had lasted 40 hours, the lava produced estimated 15 million m3, average production 100 m3 per second. Length of fissure 23 January, 1500 hours, 1.8 km. 26 January it had extended to nearly 3 km but eruption concentrated to about 400 m stretch near middle building up tephra cone eruption about 50 m. Column reached 9 km 25 January. Night before 26th Heimaey town was covered with tephra layer 10 cm harbor to 2 m thick near craters. Last night thickness decreased considerably. Direction fissure NNE/SSW 27 January 1700 hours. Measured crater first time today. Relative height about 100 m eruption somewhat diminishing today." The NOAA-2 satellite made a pass over the Helgafell eruption at 1040 UT on 24 January 1973. The instrument used was a very high resolution radiometer (DHRR). The DHRR has two spectral centers—two central bands—one in the thermal infrared at 10.5 and 12.5 µm, and the other one at .6 and .7 µm. On the infrared image the eruption showed up in both the thermal and the visible as 8 resolution elements. The eruption cloud showed up trending approximately E-W, going in an easterly direction from the source of the cloud in the west. The eruption cloud was 60 km long and its maximum width was 12 km. Iceland, which was dark at the time, was not picked up as a visible image. However, the satellite did observe the eruption cloud, which was illuminated by the sun at the same time on 25 January at 1040 UT. It observed essentially the same pattern as the thermal. What is most interesting about the visible image is that you can see the fissure aglow with the molten lava. The volcanic eruption on Heimaey shows up as a very thin, faint line which is oriented N to NE. The resolution of the DHRR system in both visible and infrared is 0.8 km. It is a fairly extraordinary series of images. Information Contacts: Card 1545 (23 January 1973)S. Thorarinsson, Science Institute, University of Iceland; Flosi Hrafn Sigurdsson, Iceland Meteorological Office. Card 1547 (24 January 1973)Flosi Hrafn Sigurdsson, Iceland Meteorological Office. Card 1549 (26 January 1973)F.H. Sigurdsson, Icelandic Meteorological Office; Adelsteinn Sigurdsson, Icelandic Marine Research Institute. Card 1551 (26 January 1973)Sigurdur Thorarinsson, Science Institute, University of Iceland; Paul Mohr, Smithsonian Astrophysical Observatory. Card 1552 (29 January 1973)Sigurdur Thorarinsson, Science Institute, University of Iceland. Card 1556 (31 January 1973)Paul McClain and Donald Wiesnet, NOAA/NESS; Richard Williams, U.S. Geological Survey. The following information was received by cable on 13 February 1973. "On 13 February the eruption was still continuing. The area of the lava flow is now 3 km2, and the volume is about 110 million m3. The composition is gradually changing from hawaiite to more normal basalt. The harbor is now nearly closed due to the lava flow, but the amount of tephra fall is relatively small. The height of the new cone (tentatively called 'Kirkjufell') is 160 m and the estimated rate of flow is now 60 m3 per second [on 8 February]." A new development on Heimaey on 19-20 February originally appeared to increase the threat to the town of Vestmannaeyjar. According to a cable received on 23 February, however, "the development in Vestmannaeyjar on 19-20 February did not increase the threat to the town. The part of the crater wall facing the town slowly 'glided out' and subsided about 120 m distant. The lava now flows east and northeast. The greatest danger if the eruption lasts for a long time is still the lava flow. The lava is now thin-flowing and the latest temperature was 1,090°C, as measured by the physicist, Dr. Sigurgeirsson." Information Contacts: Card 1567 (13 February 1973)Sigurdur Thorarinsson, Science Institute, University of Iceland. Card 1569 (23 February 1973)Sigurdur Thorarinsson, Science Institute, University of Iceland. Helgafell status as of 9 March 1973: The eruption is now considered moderate. Tephra is still falling, but is rather minor compared to the fall during the early part of the eruption. It is being blown out to sea. The principal characteristics of the eruption are the lava flow and the intermittent explosions. The lava is flowing out to sea, and is 30 m away from closing off the entrance to the harbor. Gases seeping in to the cellars of the homes have become a serious problem. These gases are CO, CO2, and SO2. S. Thorarinsson reported by cable on 24 March that there has been no increase in the activity of the Heimaey volcanic eruption. The lava production has been approximately 10 m3/s since 17 March. Lava has covered at least 80 houses in the eastern part of the town, including 23 on the night of 22-23 March, but no more since then. The lava is somewhat more thin-flowing than before. Information Contacts: Card 1582 (12 March 1973)Sigurdur Thorarinsson, Science Institute, University of Iceland; Mr. Helgason, Icelandic Embassy, Washington DC, USA. Card 1591 (26 March 1973)Sigurdur Thorarinsson, Science Institute, University of Iceland. The mostly submarine Vestmannaeyjar volcanic system is the southernmost and youngest volcanic center of the Eastern Volcanic Zone that cuts across E-central Iceland. It consists of a roughly 30 x 40 km group of basaltic volcanic islands and submarine cones occupying a shallow shelf off the S coast of Iceland, and was the site of two of Iceland's most noted 20th-century eruptions. 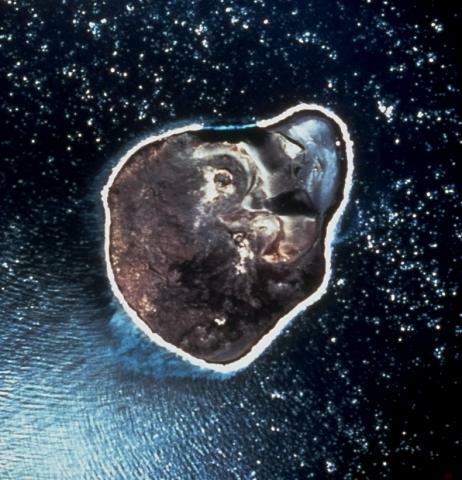 The new island of Surtsey grew from the ocean floor during 1963-67. 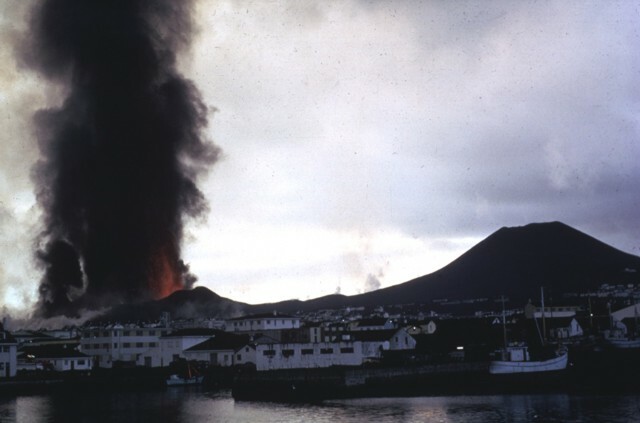 The island of Heimaey, 20 km to the NE, was the site of dramatic eruptions in 1973, during which lava flows partially overran the town of Vestmannaeyjar and threatened its harbor. Several other volcanoes have erupted during historical time. Twenty-two postglacial eruption sites are known, and all ten subaerial vents on Heimaey are of Holocene age. This volcano is located within the Surtsey, a UNESCO World Heritage property. Einarsson T, 1974. The Heimaey Eruption in Words and Pictures. Reykjavik: Heimskringla, 88 p.
Jakobsson S P, Pedersen A K, Ronsbo J G, Melchior Larsen L, 1973. Petrology of mugearite-hawaiite: early extrusives in the 1973 Heimaey eruption, Iceland. Lithos, 6: 203-214. Leys C A, 1983. Volcanic and sedimentary processes during formation of the Saefell tuff-ring, Iceland. Trans Roy Soc Edinburgh: Earth Sci, 74: 15-22. Mattsson H B, Hoskuldsson A, 2005. Eruption reconstruction, formation of flow-lobe tumuli and eruption duration in the 5900 BP Helgafell lava field (Heimaey), south Iceland. J. Volcanol. Geotherm. Res., 147: 157-172. Mattsson H B, Hoskuldsson A, Hand S, 2005. Crustal xenoliths in the 6220 BP Saefell tuff-cone, south Iceland: evidence for a deep, diatreme-forming, Surtseyan eruption. J. Volcanol. Geotherm. Res., 145: 234-248. Mattsson H, Hoskuldsson A, 2003. Geology of the Heimaey volcanic centre, south Iceland: early evolution of a central volcano in a propagating rift?. J. Volcanol. Geotherm. Res., 127: 55-71. Thorarinsson S, 1967. Surtsey - The New Island in the North Atlantic. New York: Viking Press, p 1-47. There is data available for 10 Holocene eruptive periods. 1637 Oct 1638 Feb 28 ± 60 days Confirmed Historical Observations SW of Heimaey ? There is no Deformation History data available for Vestmannaeyjar. There is no Emissions History data available for Vestmannaeyjar. 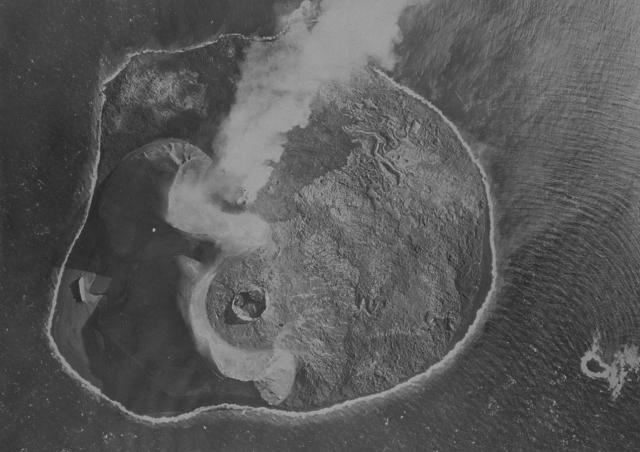 Two water-filled vents cap Jolnir Island on August 22, 1966, less than two weeks after it ceased erupting. Jolnir was formed during repeated submarine eruptions that began in October 1965 immediately SW of the new island of Surtsey (upper right). Jolnir Island was repeatedly built above sea level and then destroyed by erosion before it ceased activity on August 10. No lava flows were produced at Jolnir, and a month after this photo was taken the loosely consolidated ash deposits disappeared beneath the sea for the final time. Photo by Richie Williams, 1966 (U.S. Geological Survey). Lava flows issue from three small cinder cones on the newly formed island of Surtsey on August 27, 1966. Surtsey began erupting in November 1963 and soon formed a new island. Lava effusion began in April 1964, ensuring that the new island remained permanent. Eruptions at Iceland's newest island continued until 1967. The small island of Jolnir in the background began growing 0.8 km SW of Surtsey at the end of October 1965. It repeatedly was destroyed and grew again above the sea surface before it ceased activity on August 10, 1966. An April 1968 vertical aerial photo looks down on the new 2-km-wide island of Surtsey less than one year after eruptive activity ceased. 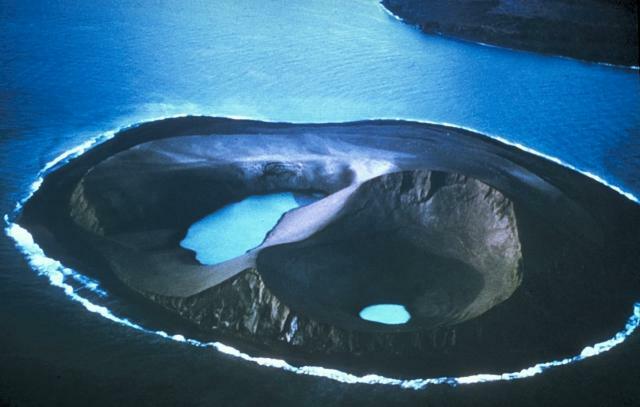 Iceland's newest island was formed during eruptions from November 1963 until June 1967. Initial submarine eruptions rapidly produced a new island that became permanent after lava effusion began in 1964. Several other ephemeral islands around Surtsey that were not armored by lava are now eroded beneath the sea. Photo by National Aeronautical and Space Administration (NASA), 1968. The northern halves of circular tephra rims on the new island of Surtsey are vestiges of the pyroclastic stage of the eruption, which lasted from November 1963 through the winter of 1964. 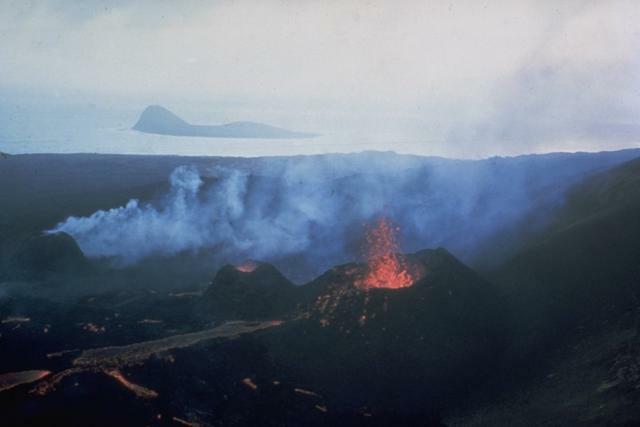 The circular central vent of Surtur II (bottom) and its contiguous lava shield to the south were formed in 1964-65 during a major period of lava effusion. Another effusive fissure eruption from the floor of Surtur I (top), yielding the dark-colored lava on the top side of the photo (east), was in progress at the time of this October 1966 photo. Photo by Icelandic Survey Department, 1966 (published in Green and Short, 1971). An ash-laden eruption column rises above a volcanic cone behind the town of Vestmannaeyjar on the island of Heimaey in 1973. 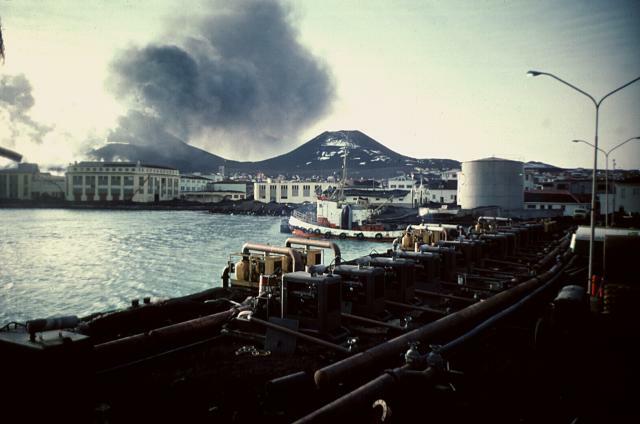 The pumping operation in the foreground was designed to cool the front of an advancing lava flow that threatened the town and its harbor. Twenty-two postglacial eruption sites are known in the mostly submarine Vestmannaeyjar volcanic system, which occupies a shallow shelf off the southern coast of Iceland. It contains the renowned island of Surtsey, which grew from the sea floor in an eruption that began in 1963. Photo by Jack Lockwood, 1973 (U.S. Geological Survey). The harbor of Heimaey Island is seen here in 1974, in the aftermath of an eruption that produced a lava flow that almost blocked the harbor. The flow, which originated from a fissure extending from Eldfell cinder cone (upper right) forms the peninsula at the upper left. Extensive pumping efforts were undertaken to cool and stop the advance of the flow. The diversion attempts were locally successful. The flow eventually stopped, after extending the shoreline up to 1.1 km over a 2.7-km-wide area, and provided a more sheltered harbor. Photo by Robin Holcomb, 1974 (courtesy of Jack Lockwood, U.S. Geological Survey). An eruption column rises above the town of Heimaey from a fissure extending from Eldfell cinder cone (right) during the 1973 eruption of Vestmannaeyjar volcano off the southern coast of Iceland. The eruption produced a lava flow that almost blocked the harbor; an extensive water pumping operation was implemented attempting to slow the advance of the flow. Photo by Tom Simkin, 1973 (Smithsonian Institution). The Global Volcanism Program has no maps available for Vestmannaeyjar. The following 31 samples associated with this volcano can be found in the Smithsonian's NMNH Department of Mineral Sciences collections, and may be availble for research (contact the Rock and Ore Collections Manager). Catalog number links will open a window with more information. Catalogue of Icelandic Volcanoes (Link to Vestmannaeyjar) The Catalogue of Icelandic Volcanoes is an interactive, web-based tool, containing information on volcanic systems that belong to the active volcanic zones of Iceland. It is a collaboration of the Icelandic Meteorological Office (the state volcano observatory), the Institute of Earth Sciences at the University of Iceland, and the Civil Protection Department of the National Commissioner of the Iceland Police, with contributions from a large number of specialists in Iceland and elsewhere. This official publication is intended to serve as an accurate and up-to-date source of information about active volcanoes in Iceland and their characteristics. The Catalogue forms a part of an integrated volcanic risk assessment project in Iceland GOSVÁ (commenced in 2012), as well as being part of the effort of FUTUREVOLC (2012-2016) on establishing an Icelandic volcano supersite. Large Eruptions of Vestmannaeyjar Information about large Quaternary eruptions (VEI >= 4) is cataloged in the Large Magnitude Explosive Volcanic Eruptions (LaMEVE) database of the Volcano Global Risk Identification and Analysis Project (VOGRIPA).